An assortment of succulents, shrubs, aloes, trees, and container plants will be sold off at ridiculously low prices of up to 50%. Entry to the garden will be free on this weekend only. Advice on gardening, plant health and general care will be provided. For details on the selection and prices of plants please click the Plant Stock List to see what’s on offer (see attached). Buy plants to the value of R400 and get a plant voucher to the value of R100 free. Other exciting things on offer this weekend include free guided tour of the garden on Saturday at 14:00 and Sunday at 12:00. Bookings are essential as there is only a limited amount of space available. 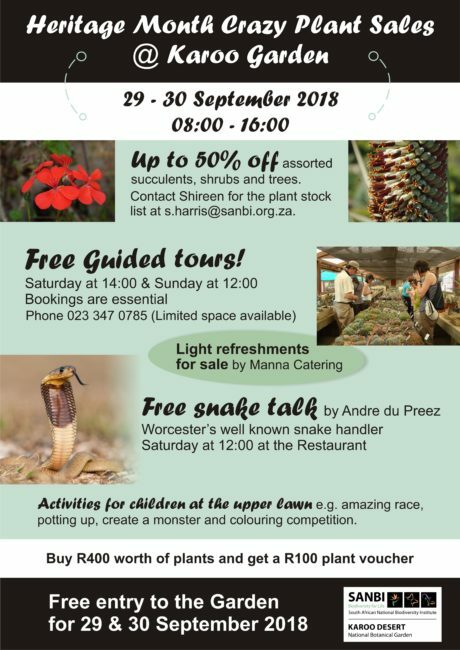 There is a free snake talk at the restaurant on Saturday at 12:00 by André du Preez, a local snake handler. Activities for children will include an amazing race for children over 10, a potting up station, create a monster with organic play dough and a colouring competition for children between 1-5 years and 6-10 years.